A crane is an invaluable piece of equipment on certain jobs. 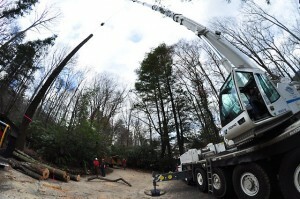 Typically if a tree needs to be removed and is not safe to climb or if a tree has fallen on a structure such as your home, making removal difficult, we will use a crane. The job is safer, more efficient, and more economical than using standard climbing and rigging techniques. We have greater access to trees that are difficult to reach because of their location or hazardous nature by using a crane. Our crane operators are all certified and knowledgeable about appropriate safety measures. We want to make sure that a job requiring the use of a crane is completed without any damage to your property. In addition to crane service in the High Country, we can also help you if you need tree pruning, view enhancement, tree removal, stump grinding, bucket truck service, lightning protection, tree cabling, pre-construction consultation, and fertilization and pest control.